hello, brides! Today I'm writing to chat about a lovely little custom piece we did for one of my favorite brides, Lauren. 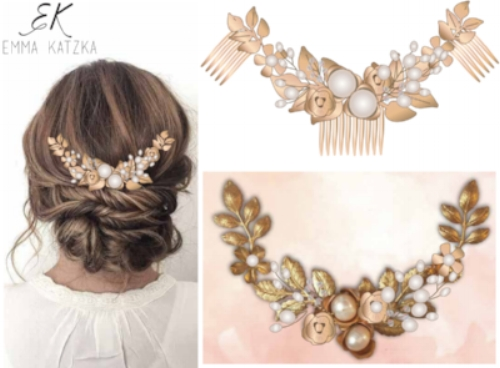 I know lots of you are probably curious about the custom process, and I thought this piece would be a perfect opportunity to show you all how much room there is to play and truly make your bridal hair accessory your own. Enter Lauren. She's a super stylish, design-minded bride who met me at (case in point) a bridal show run by Etsy. She loved two of my pieces (Aphrodite and Octavia), but wanted something in between the two, size-wise. I told her no problem, and to contact me when she was ready. A few months later, she told me she was ready to hammer out the details. She sent me some photos of her dress, her color palette, and her planned hairstyle. She also sent me a photo of some bracelets that she had purchased for her bridesmaids, asking if I could incorporate some of the elements from the bracelets so that she could match her maids. You can literally draw inspiration from anywhere with a custom piece. I loved working with Lauren, and can't wait to see the photos from her wedding!